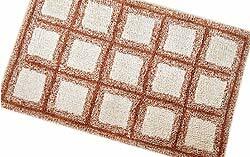 High quality, well designed bath mats which can be used from both sides. The sides are designed in contrasting colours or patterns to render a smart, yet different look to the mats so that every time you change the side, you get a new feel. 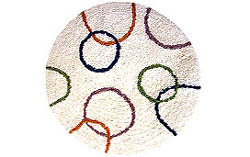 Description:These round bath mats look extremely funky and elegant with their circle & oval designs created using miscellaneous delightful colors. 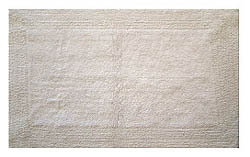 Description:Exquisite pieces of rectangular bath mats are both traditional and trendy in look. These are stylish accessories for the bathroom. 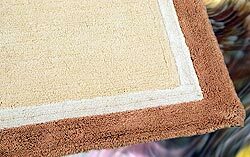 Description:These light weighted reversible bathmats are proficiently finished so that either side can be used as the outer side. Description:Developed from water absorbent material, these absorbent bath mats are delicate and skin friendly. The look of these bath mats is truly mesmerizing. 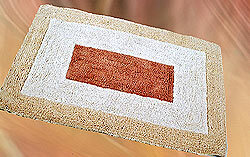 Description:Handcrafted bath mats add finishing touch to bathroom decor. 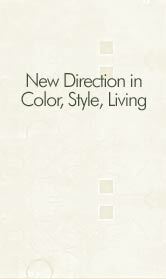 Brown, white & yellow rectangular designs are incorporated to them. 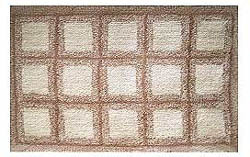 Description:Bathroom floor mats provide bathers the distinct experience emerging from the bath. Square patterns of these mats beguile the viewers. 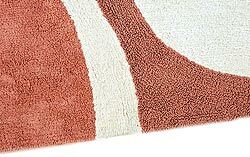 Description:Resistant to stain and smooth in touch, these luxurious reversible bath mats are extensively durable. They can be used from both sides.